We aim to provide a personal service tailored to your requirements. In your personalised package, we can suggest which cars go well together (see some suggestions further down this page) so that your wedding convoy can go off in style. So cars for the Bride, her attendants, the Groom, his ushers, family and guests can all be accommodated. 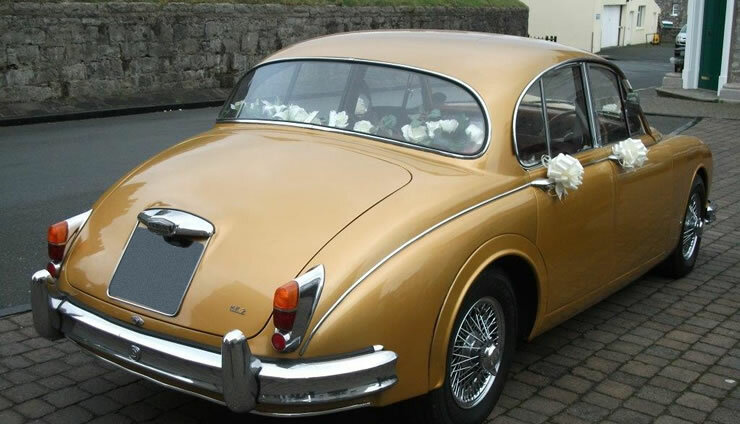 Or if you just want that extra special car for the Bride and Groom, then don’t hesitate to approach us to help make your day magical. We try to keep our fleet in a pristine condition, and lovingly polish the cars on a regular basis. We decorate the cars with ribbons and bows in your choice of colour, so that they can complement your colour scheme of the day. We also decorate them with flowers and a horseshoe, and include a bottle of champagne (or non-alcoholic equivalent) in the main car. We also carry large umbrellas, just in case the weather is not in our favour! 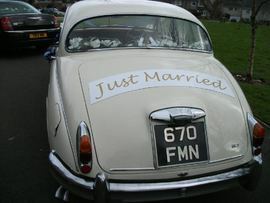 As there are more weddings and receptions now taking place at the same venue, we are more than happy to arrange a special package for you to transport the Bride and her party to the venue and then to stay for photos with the car(s) after the service, or to even take the new Mr & Mrs for a little chill-out drive. Full details can be found on the Cars page.